Kunskapsakademin (The Knowledge Academy) is an elementary school with students in grades 4-9. The school is located on Alnö, an island outside Sundsvall, Sweden, in beautiful natural surroundings. Students work extensively on projects with different missions. The approach aims to create links between the school and the other communities. In their work about Asia, students worked in collaboration with Bike 4 Cambodia. For the students, it meant that they had a direct contact with the people of Cambodia through pictures, videos, e-mails and stories from us and our contacts in Cambodia. For Bike 4 Cambodia we are able to share knowledge through our experiences and create dialogue and understanding in both directions. The student’s work culminated in a charity night where they presented their work about Asia, alongside food and entertainment also created and provided by the students themselves. 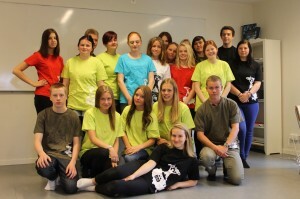 The charity evening, an art auction and a day in which students worked to fundraise, raised a grand total of 29 000 SEK / £2800. The money was donated to Bike 4 Cambodia, and 100% of the money will be invested in education in the Kampong Cham district.